What if we were to see our roots exposed like this tree? How long would they be? How far would they reach? What understanding would this sight bring of who we are and where we have been and where we are going? I came upon this tree last week. Earlier that week, I had lost our family dog of almost 13 years. This tree brought solace. 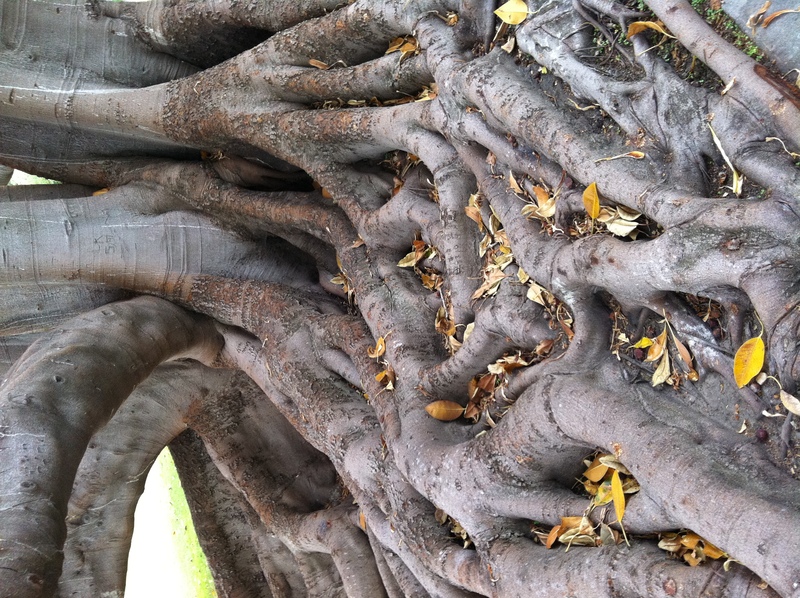 I sat upon its roots, within its deep crevices. Wisdom. This is what I thought when I first saw the tree. What wisdom it must have, and would it share some with me. I asked for its message, its lesson for me. I heard the word sprawl. The word sprawl means to spread out over an area in an irregular or untidy way. At first glance, to an “untrained” eye, I suppose the roots do look irregular and untidy. If it were on a person’s personal property they may even be seen as a nuisance, worrying about the foundation they might crack. To my eye, which sees the so called untidiness of nature as beauty and in perfect order, these roots were the most beautiful and magical image I have seen. But what does the word sprawl mean for me? There is beauty, adventure, magic and beyond this- natural instinct to sprawl- from within our center to outside- everywhere. To touch as much as we can. To reach and expand to and for our fullest potential in this bodily, earthly form. In my fear. My hesitation. My ability to over-think and out-smart, so not to let too much in for fear I may feel too good or be hurt too badly, I’ve not sprawled and expanded like I long to, as this tree has. As this tree shows. That is its lesson for me. Reach. Expand. Sprawl as I have never done before. I’ve noticed a certain joy creeping up inside of me in this week of my dog passing. The grief, tells me to be loyal- remember no joy. Something bad has happened. As sad as it was to watch my dog die, as someone said, the experience showed me who I am and who I was in those moments was open, vulnerable and courageous. I faced what I feared. Perhaps facing our fears sprouts our seeds of joy. But how can they grow, if I squash them with my loyalty to sadness and despair. It is not that I choose to deny my grief. I feel it when it is here, but I am also aware I am more comfortable in grief, sadness and despair than I am in joy. I must make room for that which I am unsure of. When we are being stretched to go beyond what is comfortable, we might feel pissed off. Scared. Disloyal. We think we do not want to be moved beyond what’s pleasant, but actually we do want this. We want to be stretched. Moved. We long to sprawl. Expand. To reach to our fullest potential.